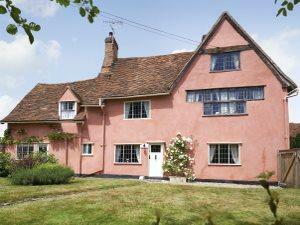 Cressland01473 822815work Self-cateringCressland is a characterful, Grade II* 15th Century, timber framed, self-catering holiday cottage, located right next to the famous `Splash' in the heart of Kersey, one of the most photographed, and picturesque villages in Suffolk. Whilst retaining the spirit of the past, with exposed beams, open fires and original floors, Cressland has been sympathetically and tastefully restored to an exceptionally high standard and has been awarded Five Star Gold by VisitEngland. The cottage sleeps up to eight people, with 4 bedrooms and 3 bathrooms. It has a luxury, spacious feel with bath robes, hotel quality linen, The White Company products and fresh flowers all provided. The sitting room has an open fire (perfect for relaxing and snuggling up in front of), whilst the dining room has a large inglenook with wood burning stove (barrel of firewood provided). The spacious country kitchen/breakfast room is well equipped, with large dining table and settle, TV, dishwasher, fridge/freezer, washing machine/dryer. There is a cottage garden which features a terrace/dining area, barbecue and summerhouse. Other facilities include: 2 iPod/iPad/CD docking stations, 2 flat screen TVs, Freeview, DVD, free unlimited Wi-Fi, family games, children's toys, outdoor games and parking for 2 cars. There is so much to do and see in the local area, perfect for walkers and cyclists (Kersey is on the South Suffolk Cycle Route) with walks straight from the door. The Bell Inn is just 200 yards from the cottage and is a friendly traditional pub serving good food, with a dining terrace and play area. The village has a playground and football pitch. Cressland is the perfect location for a romantic break, family holiday or corporate retreat from where to explore Constable Country, Suffolk's idyllic open countryside, beautiful unspoilt villages, and the Suffolk Coast. A characterful, Grade II* 15th century, self-catering holiday cottage, overlooking the famous ‘Splash’ in the picturesque village of Kersey. There are 4 golf clubs all within 20 minutes from the cottage. Kersey Mill Fitness Centre has a well equipped gym and offers a range of classes. Hadleigh Swimming pool is 10 minutes by car. Cressland is located right next to "The Splash" (Ford) on The Street in Kersey.